When you're SSH'd into a remote host, this will take the output of commandThatMakesOutput and pipe it to the pbcopy command of the desktop machine that you ssh into from the remote host. In other words, you ssh back into your local machine from the remote host, passing output from commandThatMakesOutput back to pbcopy on your local machine. There is one required step and three recommendations. First, you must configure your local desktop as an SSH server. I'm assuming you're aware of any security risks you might be taking when doing this. 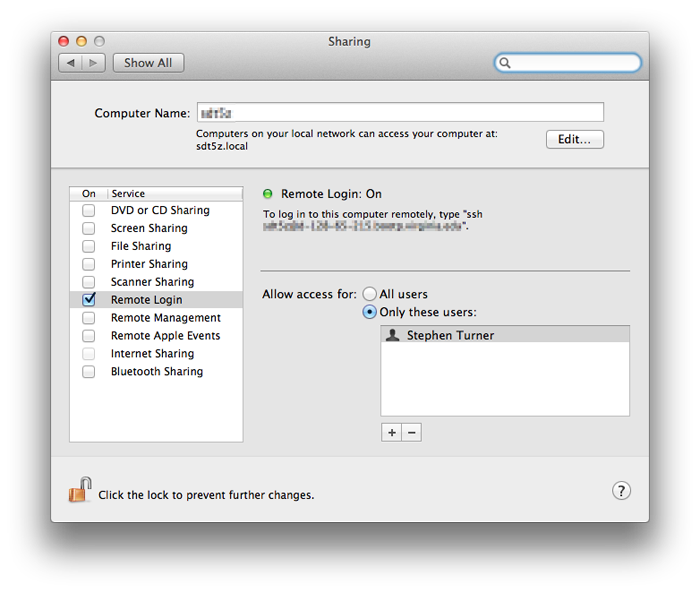 Open system preferences, sharing. Enable remote login, preferably allowing only you to log in, for added security. You'll set up SSH keys later. Here, take note of how to SSH into your machine. I've blurred out my IP address where it says "To log into this computer..." This brings up the first recommendation: you need a static IP address for this to work well, otherwise you'll have to constantly look up your IP address and modify the command you'll use to SSH back into your local machine from the remote host. Most institutions simply hand out static IPs if you ask nicely. The second recommendation is that you create an SSH key pair, storing the public key on your mac in ~/.ssh/authorized_keys and your private key on the remote host, so that you don't have to type a password. Make sure you chmod these files appropriately. I'll leave this up to you and Google. Finally, you want to alias the command on your remote host to some quick command, like "cb". Preferably you'll add this to your .bashrc, so it's sourced every time you log in. E.g. I don't really know what this would do with anything other than small bits of ASCII text, so if you pipe binary, or the output of gzip -c to pbpaste, you're voiding your nonexistent warranty. Presumably there's a way to do this with Windows - I don't know of a command-line utility to give you access to the clipboard, but if you can think of a way how, please leave a comment. Thanks for posting this Stephen. Just trying this out I've found this works well and I like the pipe aspect of it so I can move directly from our cluster to my desktop for data analysis. Going to have to test drive it a little more and set it up in my aliases. I also have been using third party cloud storage at the command line (see my blog post here: http://bit.ly/11DSY3N), but your post is handy for the SSH pipe pbcopy command alone. Thanks again!